TaxProf today noted the article in the New York Times about the EITC: Casey Mulligan, Do Tax Credits Encourage Work? New York Times ( 2012). Mulligan, an econ prof at the University of Chicago (home, of course, to Milt Friedman's "free" market theories) noted that the EITC "could" discourage work. The chart below shows the credit’s schedules for the 2011 tax year as a function of annual earned income for a given family situation (other family situations have the same basic shape). The schedule shown illustrates [a] mountain-plateau pattern ... an increasing portion for the lowest incomes, a flat portion, a decreasing portion and then finally a flat portion of zero. Now, Mulligan surely knows that this theory about whether the credit encourages or discourages work is just that--a theory. Much of the assumptions about when people will stop working and substitute leisure don't seem to hold up in practice, partly because there are so many other factors at work besides the rather simplistic assumptions in freshwater economics (such as the joy of working, status of work, self-esteem of work, etc.). Nonetheless, Mulligan can't help adding another line that makes the overall comment suggest that he thinks the EITC will on the whole discourage work. 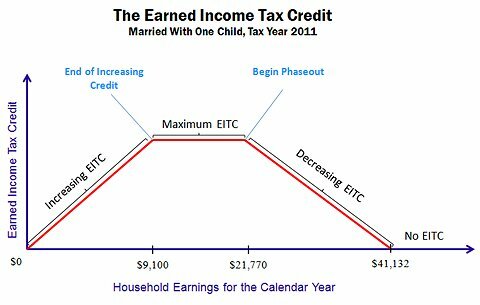 [I]t is more common for families to be on the part of the earned-income tax credit where it acts as a tax, rather than a reward to additional work. Of course, when economists talk, policy makers often listen. This is a good example of when they should say--huh? and get a second opinion. What we should care about as a tax policy matter--which, I remind you, is distinct from what we might care about purely as a question of economic "efficiency"--is whether the EITC will generally work to encourage those who otherwise have tended to be left out of the work force but should be in it and whether the potential negative effect at the drop-off would be likely to be genuinely detrimental to that group or rather impact groups for whom the difference may not matter so much. Ted Seto, a fellow tax prof in sunny California, commented on the Tax Prof item to point out the important empirical evidence that the EITC is mostly working as we want it to. "The overwhelming finding of the empirical literature is that EITC has been especially successful at encouraging the employment of single parents, especially mothers. There is little evidence, however, that the EITC has reduced the hours worked by those already in the labor force. The empirical literature on married women is somewhat smaller but again consistent in its findings. The studies show that the EITC leads to modest reductions in the employment and hours worked of married women." The latter problem -- the one area identified in which the EITC does seem to have a negative effect on paid work -- is not an EITC problem at all. It's the same secondary worker problem Ed McCaffery has written about, (Taxation and the Family: A Fresh Look at Behavioral Gender Bias in the Code, 41 UCLA LAW REVIEW 983 (1993)), and it affects secondary workers up and down the income range. In Economists (and Non-Economists) Behaving Very Badly Indeed Watch, Brad DeLong accosts the austerity bandwagon that objects to any more federal stimulus, whether from Congress or from the Fed. At the moment our flow of nominal spending at $14.7 trillion per year is some 12% below its pre-2008 trend. And in the absence of any 12% decline in prices and wages, that shortfall in spending has to produce our current macroeconomic distress: there is not enough "money" to support enough of a flow of spending to chase all the goods we could produce. We don't have a deficiency of real supply (for whatever reason). We have a deficiency of nominal demand. This is the problem we all know and recognize. Since the financial crisis hit, banks, corporations and individuals have been deleveraging, and that means not enough money is out there being spent. The stimulus bill was a bare minimum that staved out utter depression, but (on Republican insistence) was larded with much too many tax breaks for big corporations rather than targeted 100% towards the population that would best put the money to work in the economy. Private saving means that public spending has to step into the gap. We did some, but not enough. Jobs were saved, but not enough new jobs were created. Thus, the Fed has a new proposal for a $600 billion stimulus--quantitative easing (essentially, printing money rather than borrowing it). This is a good idea, especially since we can expect either gridlock or Republican policies holding sway in Congress for the next two years, which means that the plight of ordinary Americans will take a back burner to ensuring the "competitiveness" (read--high profits) of US multinationals and cutting federal workers, federal benefits, Social Security and Medicare. As DeLong notes, even a bunch of conservative economists of times gone by (including Milton Friedman) would say that "it is a central bank's business to intervene in asset markets to boost the flow of nominal spending back to what everybody expected it to be and counted on it being." now we have a bunch of economists and non-economists behaving very badly: saying not only that the government shouldn't boost its spending but that the central bank shouldn't buy bonds for cash either. How do they think we got into a crisis that has depressed employment all around the advanced world? I don’t think they have an answer; I think all they have are wild stories about how Obama’s Sharia-law Marxism has unnerved business, or something, with the effects mysteriously spreading to Spain and Latvia. Apparently, [the right-wing, nihilist economists] are right because they say they are right, and they don't need no stinking facts, models or studies to back their views up. BTW, didn't we try their way during the Hoover administration and it didn't work then? Rob in Fl. Links Worth Noting--Frustrated with EMH? a Rubin Grill? Naked Capitalism posts on Rubin's upcoming grilling (or "grill-lite"--since there is no experienced litigator to do the questioning) by the Financial Crisis INquiry Commission. LMB here: Rubin, a Wall Street Insider, was a proponent of many of the ideas that gave financial institutions ridiculous license to gamble in a way that socializes losses and privatizes gains--covert bailouts, financial innovation, a policy of nonregulation of derivatives, the "new" risk diversifying (ha) financial innovation based economy, etc. Yves has a very good point about all that at the end of her post. "In other words, we need to come up with standards of what should be unacceptable behavior. Rather than focusing on what was legal, which gives an industry that devised overly lax rules an easy out, we need to identify what products and practices were destructive. If they happened to be legal, that is prima facie evidence that we need new rules." Naked Capitalism.